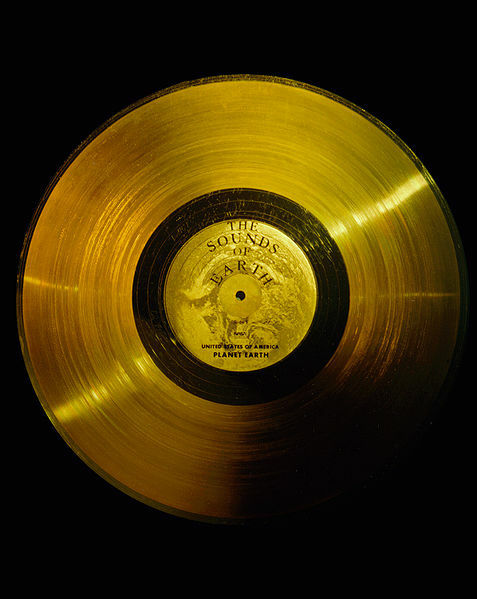 The "Golden Record" aboard the interstellar spacecraft is a time capsule of humanity, sent from 1977 to the distant future. The year was 1977. Jimmy Carter was president. Rod Stewart topped the Billboard chart with "Tonight's the Night (Gonna Be Alright)." The economy was recovering from recession. Oil was scarce. Ties may have been wide, but patience, among many, was thin. Into that turbulent and indolent and somewhat cynical world -- and on behalf of it -- NASA launched two little probes, tiny even by spaceship standards, from Cape Canaveral. Voyager 1 and its twin, Voyager 2, were initially meant to explore Jupiter, Saturn, and their moons. They did that. But then they kept going. And going. And going. At a rate of 35,000 miles per hour. One of them, almost 35 years to the day after it left Earth behind, finally ventured beyond the influence of the body that has defined so much of life on Earth: the sun. The Voyager probes are technically unmanned; in another sense, however, they carry all of humanity with them as they speed through space. Each craft bears an object that is, in every way, a record -- of Earth, of humanity, of humanity's drive to reach and strive and dream and connect. The two epic mementos, given the sunny hue of their aluminum coverings, have been dubbed the Golden Records. They were the product of Carl Sagan and a team that, in January 1977, realized the far-traveling probes would stand a better chance than most human spacecraft would of encountering extraterrestrial life. So they decided to undertake a task that was both uniquely human and uniquely of its moment: They would make a record that would, if discovered by aliens, represent humanity. They would make a time capsule of human civilization. One that would, as NASA puts it, "communicate a story of our world to extraterrestrials." An artifact that would be epic and Quixotic in equal measure. Telling humanity's story was, as team member Ann Druyan puts it in the phenomenal "Space" episode of Radiolab, "a sacred undertaking." She and Sagan and their group of, as she calls them, "half a dozen very flawed human beings" had taken it upon themselves to represent humanity as a culture and also as an aesthetic -- to explain to anything that might be out there who, and what, we're all about. They arrived at the idea during a meeting of the American Astronomical Society in January 1977; the Voyager probes would launch in late August and early September. Representing the entirety of human achievement in a single recording would have to be done quickly. So the group, as humans are wont to do, divided the labor. Jon Lomberg was in charge of assembling pictures of Earth. Timothy Ferris selected the music. Druyan, the project's creative director (and later the co-writer, with Sagan, of Cosmos, and, as of 1981, Sagan's wife) oversaw the record's "Sounds of Earth" essay. Linda Salzman collected greetings from people around the world. Sagan served as the liaison with NASA. The team set about researching -- talking to historians and artists and ethnomusicologists. They reached out to political groups and documentarians. They recorded humans speaking -- among them, in perhaps the record's most iconic track, Sagan's young son saying, "Greetings from the children of planet Earth." The result was a time capsule that was (and still is, somewhere out there in space) much more suggestive than summative. Humanity's cosmic mix tape for, and about, itself. Included on the pair of Golden Records that blasted from Earth in 1977 are sounds of the planet, including surf and wind and thunder. The record shares the tweetings of birds, and the calls of humpback whales, and the hootings of chimpanzees. It includes, via Salzman's work, spoken greetings from earthlings rendered in 55 languages -- starting with Akkadian, spoken in Sumer about 6,000 years ago, and culminating with Wu, a modern Chinese dialect. There's music, 90 minutes' worth of it -- music that includes classic tunes from cultures around the globe, including the first two bars of Beethoven's String Quartet No. 13 in B Flat. Jimmy Carter sent a message of greeting on the record. So did U.N. Secretary General Waldheim. And though the Golden Record does, indeed, adopt the form and the logic of a standard, late-'70s-era record, it's more accurately thought of as a kind of early CD: Its archive contains images from Earth (118 of them) as well as sound. So how would a notional extraterrestrial, encountering this sweeping record of human existence, actually play it? Like you'd play any record. (NASA apparently assumed that alien civilizations, should they be sufficiently advanced, would be familiar with vinyl. Which is fair.) Each Golden Record is encased in a protective aluminum jacket, along with a cartridge and, yep, a needle. 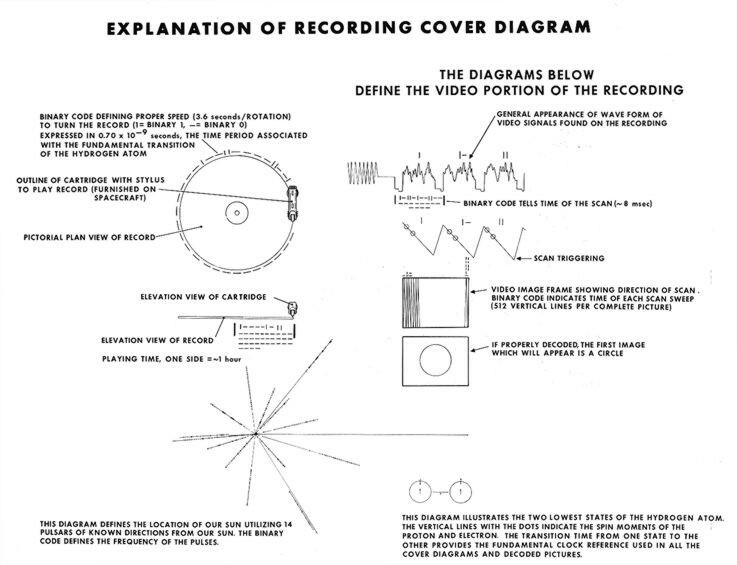 And both include instructions -- in the symbolic language you can see etched in the image above -- that both explain the origin of the Voyager crafts and indicate how the record is meant to be played. (Ideally, NASA explains, the record is played at 16-2/3 revolutions per minute.) The logic of all this is simple: It will be tens of thousands of years (if ever) before either Voyager can make a close approach to any planetary system that lies beyond our own. "The spacecraft," Carl Sagan put it, "will be encountered and the record played only if there are advanced spacefaring civilizations in interstellar space." He added: "But the launching of this bottle into the cosmic ocean says something very hopeful about life on this planet." The two Voyager craft, of course, aren't the first to contain messages for beings that are foreign to us by virtue of either place of origin or stretch of time. The moon still bears the plaque left on its surface by the astronauts of Apollo: "We came in peace for all mankind." And Pioneers 10 and 11, which preceded Voyagers 1 and 2, both carried small, metal plaques that identified both their time and place of origin -- "for the benefit," NASA has it, "of any other spacefarers that might find them in the distant future." But the Golden Records carry more than (English) words. They carry our culture. They carry the transcendent aspects of human existence: the art, the beauty, the ache, the joy. They offer what we have, and what we are, up to the cosmos -- and to anyone who might call the same space home. 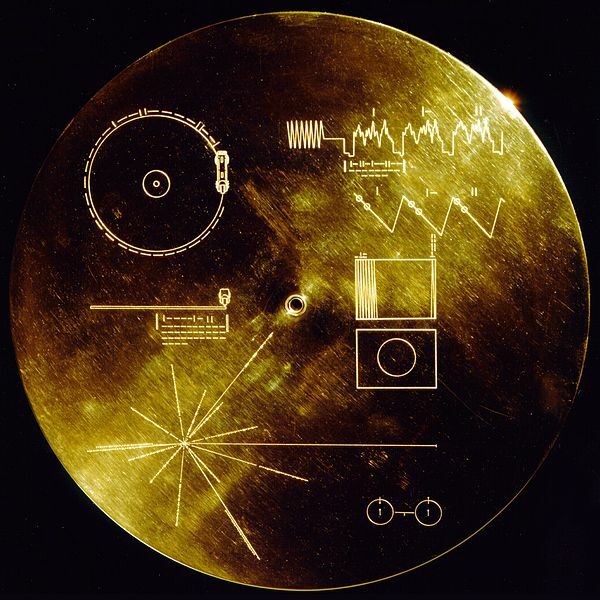 As Jimmy Carter, president when Earth's two Voyagers launched, put it: "This is a present from a small, distant world, a token of our sounds, our science, our images, our music, our thoughts and our feelings. We are attempting to survive our time so we may live into yours."